Medina actually means “city”. It is usually a part of a city, surrounded by walls. Consider it like the old town-city center. Medina of Marrakech is a UNESCO World Heritage (Centre). Founded around 1070 by the Almoravids, it was, for a long time, a political, economic and cultural center. Now, covered with a mystic sense is a place that you must visit at least once in your lifetime. 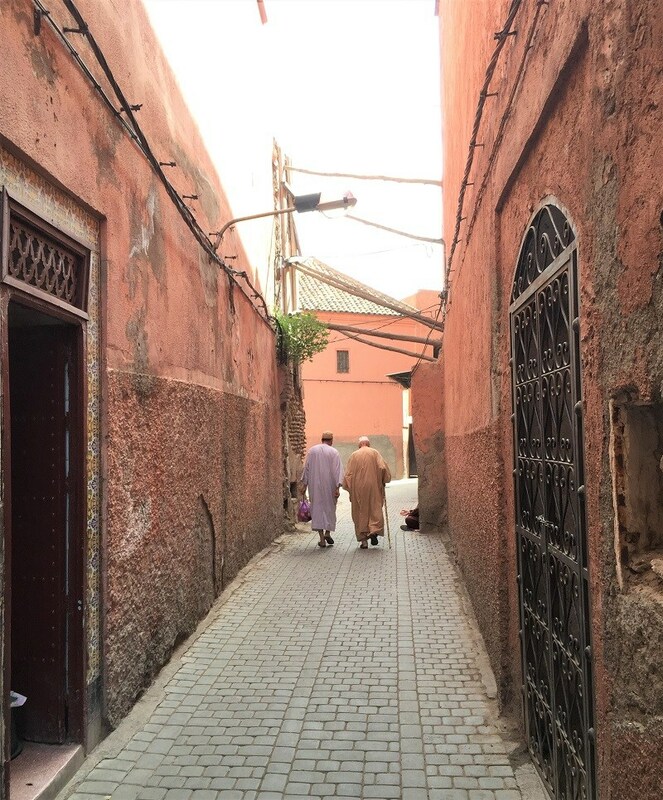 So here you will find some ideas of how to plan your days while in Medina of Marrakech. Where to go, what to see and eat! Also we have gathered some typical costs of these activities. Start your day at the Madrasa Ben Youssef. This beautiful building used to be an Islamic College. Notice the colors and the wooden doors. Walk around and go to the second floor where you can see the dormitory cells of the students. The entrance cost is only 10 MAD which is actually less than a euro! When you finish your visit head to the Marrakech museum which is almost right next to Ben Youssef. The basic reason why it worth’s a visit is the unique architecture of the building. Many exhibitions are held there if you are in a mood to discover more. The entrance fee here is 50 MAD (around 5 euros). Three minutes away from the museum is La Maison de la photographie. You will take a history lesson through beautiful pictures. We strongly recommended it especially if you like photography. The highlight of your visit there is the beautiful terrace on the top where you can enjoy drink and a great city view. Time for some mint tea! Check here for exhibitions and more info. The entrance fee is 40 MAD, but you can use the same ticket to re-visit another day. Souks & Medina are like milk & cookies. They just go together. Souks are the heart of Medina and extraordinary experience. Take big breaths (yes, you will probably need them) and dive into this little chaos. Get ready for some serious bargaining and don’t forget that is fine to say no! From tagines and leather, to colorful shoes and ceramics the options are endless. You will get lost, but don’t worry. Everything is part of the experience. Djemaa El Fna is basically a square – market place. Busy and noisy with snake charmers, animators and all kind of merchants. Full of tourists and locals almost all day long. Start your visit to the souks from there. But before that make a visit to the Koutoubia mosque (2 minutes’ walk), which is actually the biggest mosque in Marrakech. Five times a day you will hear the calling for prayer all over the Medina. Admire the beautiful minaret and the tall palm trees around. Bahia Palace is basically an empty palace with gardens. But this doesn’t mean is not impressive and unique. A combination of Islamic and Moroccan style is great for taking some nice photos! Admire the beautiful courtyards and the vivid colors. Entrance fee here is just 10 MAD. Check for more here! After wandering around Bahia Palace head to the El Badi Palace. Basically, you will see what has remained from once upon a time glorious palace. Entrance fee here is again 10 MAD. Lastly, Saadian Tombs just a few minutes walking are as the name says tombs. Not regular ones though. Get ready for the impressive mausoleum of Saadian Sultan Ahmed al-Mansour. Glorious decoration and expensive materials surround this place. Entrance fee 10 MAD. Le Jardin is a beautiful restaurant with a very nice garden. You actually eat in the garden and is like an oasis in the Medina souks. They also have a terrace. You can enjoy a dinner up there if you prefer. Try the chicken tagine (traditional pot) with lemons and olives. Terrasse des épices is another nice place to escape from the hassle and dazzle of Medina and have a nice meal. Famous place, very nice desserts. Also value for money. Nomad is located near the square of spices. Perfect place with Moroccan and international kitchen. Romantic sense and super nice terrace. Try the calamari, the couscous and of course the tagines. Reservation is recommended. Latitude31 offers a nice variety on its menu and a cute yard! Good quality and interesting combination of traditional and contemporary Moroccan cuisine. They don’t offer alcohol. These are some of our suggestions based on our experience ? feel free to explore!